It’s a simple game concept that can turn out to be very addicting! It’s kind of like Tetris. You have shapes that fall down and you have to rearrange it in stable way. You can rotate the image using multi-touch controls. Use one finger to hold the shape, use another to rotate. When you’re ready, drop the shape down. The object of the game is to stack the blocks as high as you can, without toppling them over. The most shapes you can drop is 4 per level. Any more, and the game is over. Tile the iPhone/iPod touch to help balance out the shapes and reach your goal! Keep an eye on your blocks’ facial expressions to plan your next move. Many thanks to Natali Del Conte for interviewing Christi Wilkerson (Apple, iPod marketing) on CNET’s Loaded. That gave me a first glimpse of the game in action! This article was published in iProng Magazine: Issue #31. 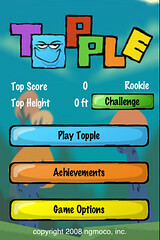 Topple is a really fun game, especially for 99 cents. I like the gyro tilt feature, where you can balance out the tower of blocks. Its a fun game to play when you have some spare 5-10 minutes and need something to do.